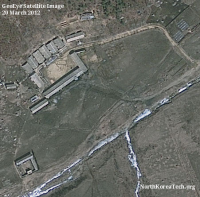 Recent satellite images of the Sohae Launch Facility on the DPRK’s west coast are providing the best glimpse yet of the center where the DPRK intends to launch a rocket in early April. North Korea says it’s launching a satellite while the rest of the world consider it a cover for a long-range missile test. Whatever the truth of the planned launch, here’s a look at some of the most interesting areas of the facility. 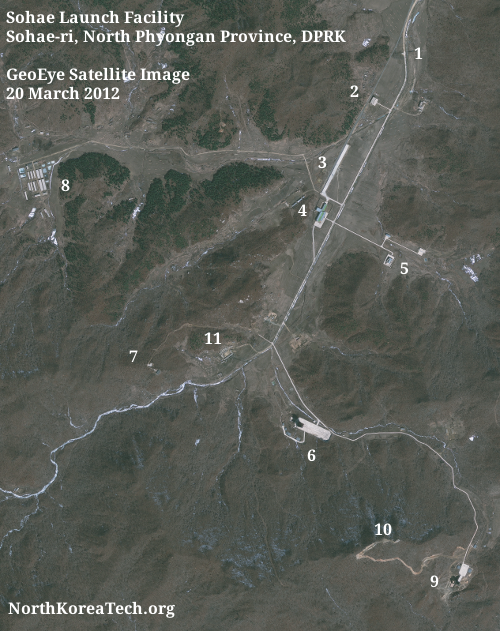 All of the information is based on analysis of the most current satellite image from GeoEye, previous images through Google Earth, and through previously published pictures of other launch facilities. And here’s those areas with a little more detail. Click on each image to get a larger view. While there are likely several layered security zones as the facility approaches, this is the recognizable main security gate. 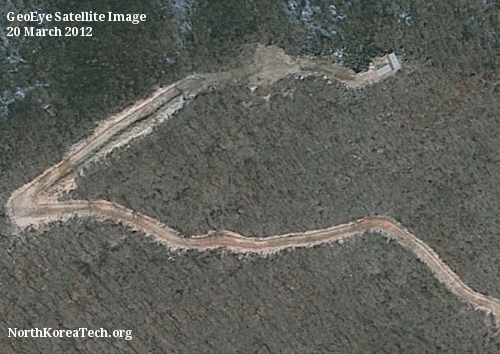 It’s situated about 2 kilometers from the main launch pad and has an area where visiting vehicles can park. The most recent image appears to show several individuals walking across the paved area. Just after the main security gate, as you drive in on the right-hand side, is what could be an office building. Perhaps for visitors and administration work that doesn’t require deeper access to the facility. Roughly opposite is a collection of several buildings. 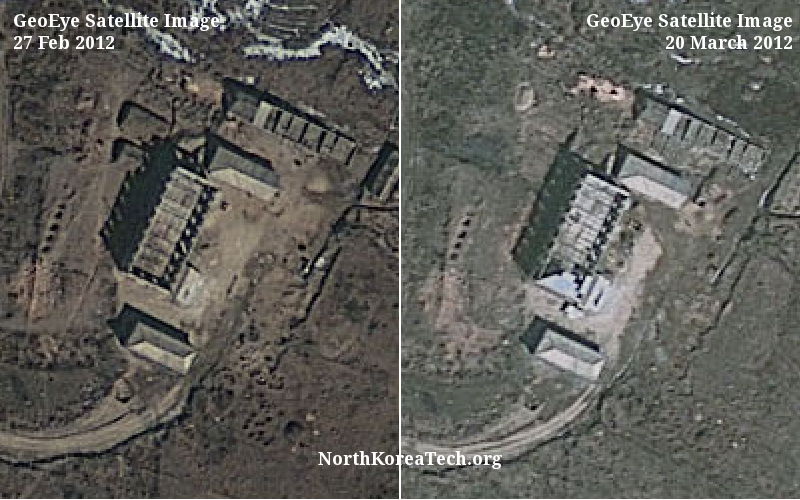 These buildings do not appear on a 2009 satellite image of the area available through Google Earth and appear to still be under construction. 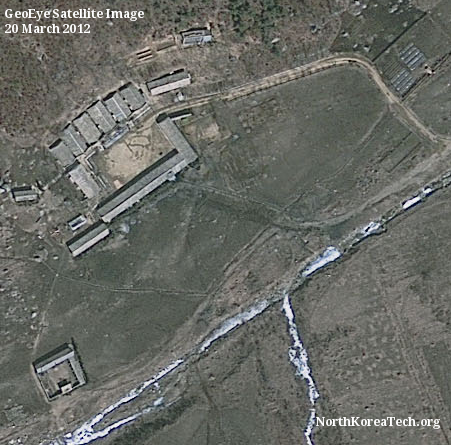 The roof on the largest of the three buildings appears to be partially complete on the 20 March image, but was missing completely from a satellite picture (not shown) taken on 27 February. A railway line to the facility is one of the larger projects recently completed. It terminates alongside a long paved area at which goods can be transferred on an off railway cars. Just to the south of the railway transfer area is a large complex that is believed to be the main rocket assembly factory. 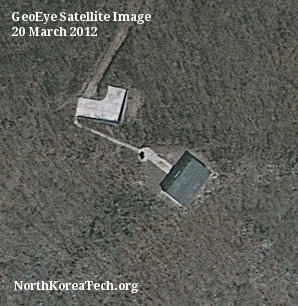 A similar structure can be seen at North Korea’s other launch facility at Tonghae. They are easily the largest buildings at the facility and appear to be about 100 meters long. It is also one of the few areas of the facility that is surrounded by a wall or fence. Directly across the facility’s main road from the rocket assembly building are three additional buildings. Two of these also appear to be surrounded by a fence. Close to the eastern-most building is what appears to be a man-made pool of water. A similar pool can be found towards the main launch pad and two additional pools appear close to the railway to road transfer point. Does anyone have any idea what they are for? 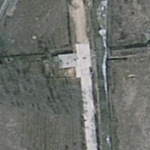 The launch pad sits towards the western end of a large concrete area in which a pair of rails is laid. When a rocket is on the pad it would be sitting next to the tower on the north side. 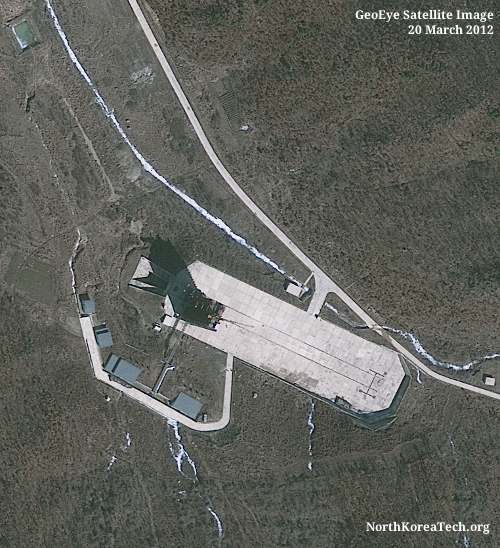 A blast deflector can be seen on the western side of the pad. This takes turns the exhaust gases from a rocket launch through 90 degrees and funnels them out horizontally on to the nearby hillside. 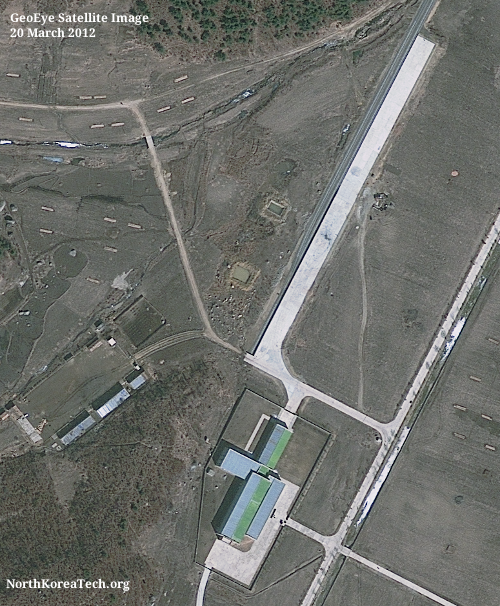 To the south of the launch pad are four additional buildings. What looks like a gantry connects two of the buildings to the launch pad, possibly carrying cables and pipes to the launch tower. These could be associated with rocket fueling and power supply. Built on a hill overlooking the launch pad, this is the launch observation building and probable launch control room. An unpaved road the building, which is about half a kilometer from the launch pad, snakes through the hillside before ending in a paved parking area. It looks like it’s been built in the opposite direction that rockets would launch so as to minimize any impact on workers should a launch go wrong. On the far western edge of the facility are a group of buildings that could be living quarters for the scientists and soldiers stationed at the site. 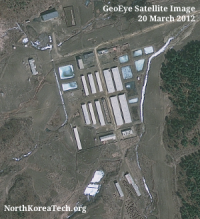 The grouping of buildings is at the end of a windy road a fair distance from the center of the site so is unlikely to be associated with any of the core operations of the facility. Indeed, the buildings could be nothing to do with the launch center, and might be a farm. 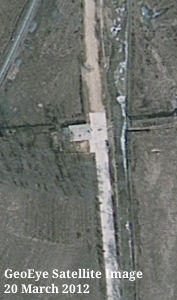 Further down the road from the main launch pad and to the south of the facility is what at first glance appears to be a second launch pad. It has a similar launch tower, blast deflector and two buildings that resemble those at the main launch pad, although it’s smaller in size and doesn’t have an rails for a movable launch platform. 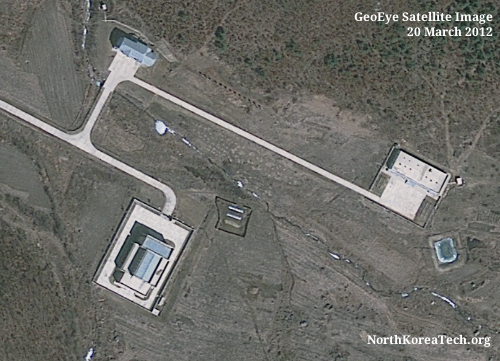 Based on analysis by GlobalSecurity.org and satellite images of North Korea’s other launch pad, this appears to be an engine test pad. If site 9 is indeed an engine test pad then site 10 could be a control room or observation room. Built on the side of the hill overlooking the pad, just like the control room for the main pad, this building appears to be smaller and possibly still under construction. 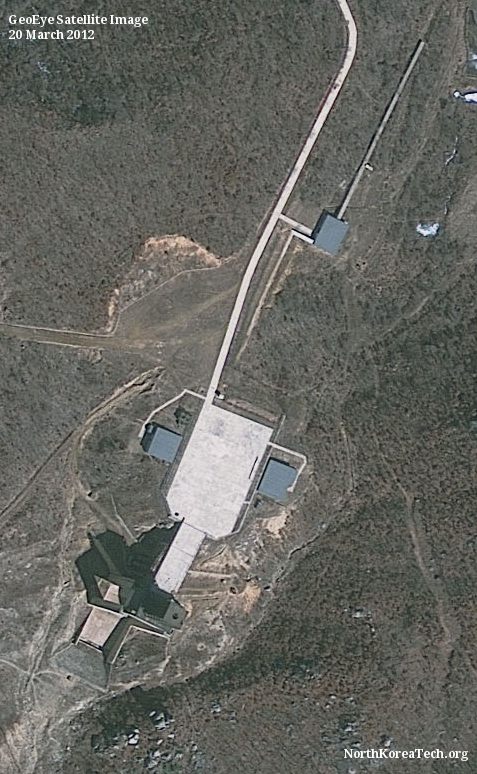 The final set of buildings worth noting are those between what is assumed to be the launch control room and the launch pad. The buildings could be offices or living quarters for the scientists and soldiers that work at the facility. If you have any thoughts on what any of these buildings could be, please leave a comment below or send me an email. at Johns Hopkins School of Advanced International Studies (SAIS).